LEGO games can be some of the more polarising titles among gamers, with many devouring each and every release, while others shun them for their grindy, repetitive nature. For lovers of the series, however, there couldn’t be a more rosy time. It would appear that the LEGO game train has picked up speed of late, with titles coming thick and fast – so much so that it is hard to keep up. Just when the studs and clicking bricks have faded from your nightmares, another game arrives to plague the back of your eyelids. It is usually easy to glance over the latest Hollywood releases and point to the most obvious to be given the LEGO treatment. Some franchises naturally lend themselves to the LEGO world – Harry Potter perhaps being the most seamless, in my view. Lord of the Rings was sure to follow – and has – but LEGO The Hobbit, however, seems like more of a forced fit. Something isn’t quite right and for the life of me it is hard to pinpoint exactly what that something is. 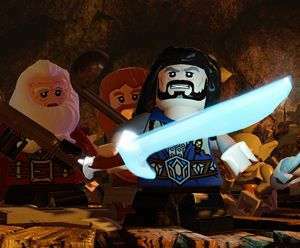 LEGO The Hobbit, like the rest of its kin, takes on the film(s) of the book, rather than the original source material, and serves up the familiar LEGO gameplay: smash, build, solve, move on, die because of the iffy camera, run away! Run away! Repeat. 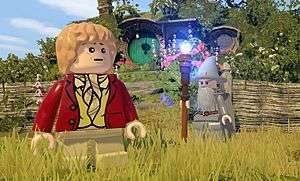 The formula hasn’t changed much over the years and this itself is a source of contention for many, although, for me, the changes that have slowly crept into the franchise, and into LEGO The Hobbit, were among the more frustrating and pointless. The most heinous sin, however, is the fact that the game is incomplete – at least as far as the story goes. Since Peter Jackson made the controversial decision to chop the book into three parts for the transition to the silver screen, the game will naturally… not include all the parts. Only the first two film instalments have made it into the game, meaning that gamers and those with poor memories of the book (like me) will be left wondering what the hell is going on. Since the final part of The Hobbit is due out this year, would it not have been more prudent and, indeed, fairer to have waited and included it, rather than serve gamers up an incomplete tale. So what happens now? Will Warner be cheeky enough to release the final part as a full game? Or can we expect a whopping great piece of DLC to be heading our way in the near future? The Hobbit is a tale of high adventure, featuring a roster of near-indistinguishable dwarves, a Hobbit, and Gandalf the McKellen, among others. Our mixed company set off to help reunite the dwarf armies and reclaim their kingdom (and riches) from a naughty dragon called Smaug, wending their way through Middle Earth and fighting some big boss enemies (as ever, the rule of three will set you free). One of the first things to strike me, aside from frustration, boredom, and anger (dwarf stacking… seriously irritating) were the new features. 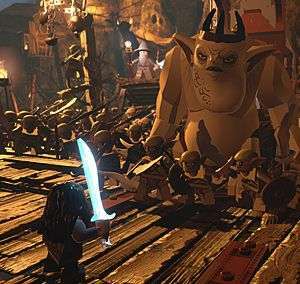 I wasn’t aware that LEGO games had any aspirations towards RPGs, but it certainly seemed that way, with the RPG-lite-lite features, such as pointless side-quests (of the ‘gather me X of Y variety’), a simple barter facility, inventory, crafting, resource gathering, collectable schematics, etc. Some may welcome the introduction of anything new in a LEGO game (after all, they have been crying out for a makeover, to some weary gamers), for me, however, I personally found it as annoying and pointless as snot. Can I just get on and play the game, please? No, because you have to gather X of Y to build a thing (in a mini-game) to get through a door just to get to the next portion of the story. You don’t just move from one chapter to the next… the (often long) path sometimes features obstacles. Although the other games have done the walkabout thing – LEGO Harry Potter had you trundling along the hallways of Hogwarts, for example, but that locale was pretty confined and far smaller in scope – we’re talking a whole damn universe here. One does not simply waltz across Middle Earth in mere moments. That’s the problem. I understand that, given the nature of the book, the game is trying to replicate the feel of an epic quest, of a long-stretching journey, fraught with hardship, and if you bear this in mind, it does work. The long gaps between story points, the obstacles to be overcome all do build up the feel of a journey. But on a practical level it can be annoying, especially if time is a factor. When LEGO games are over, that’s when you have all the time you care to expend solving puzzles, winkling out secrets, and ploughing back though levels in freeplay mode to uncover new areas. I don’t want to have to expend too much time during the game playing mini-games or grabbing resources in order to jog the story along. I understand the purpose they serve, the authenticity that they strive to create, and some gamers may well be happy with them, but I didn’t care for them, and they helped to build on the uneasy, unhappy feeling that I simply couldn’t shake. This feeling wasn’t contributed to by the visuals, by any means – the game is lovely – backgrounds are deep and dynamic, painting the world with a rich sense of life and atmosphere, from the goblin riddled caverns beneath the Misty Mountains, to the serene, but strangely mournful elf haven of Rivendell. The look of the game is doubly effective when working in partnership with the music – always a strong suit of the Lord of the Rings universe. Idle, whimsical tones trickle over Hobbiton and the Shire, while melancholy choral strains throughout Rivendell work in tandem with the surroundings to imbue a sense of great wisdom and wonder, but also loss, somehow. Part of the problem is that some of the LEGO sparkle has gone. 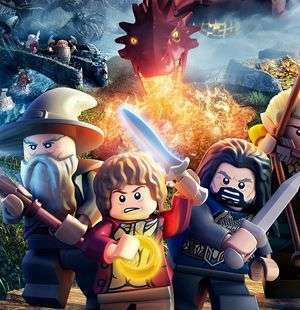 I think that The Hobbit just wasn’t a good enough fit as a LEGO game. There isn’t enough of a diverse cast for a start – the dwarves are all practically the same and trying to flick through a company of them, all milling about, to find ‘the one who has the damn bow’ – especially in one of the game’s many chaotic battle areas, when it is hard to tell who you are, let alone who anyone else is in the melee (and then jump to them without either pinballing between everyone or resorting to the selection wheel) – is a pain. Not only do you have a cluster of dwarves, those dwarves also have about three weapons each, leading to unnecessary delays and faffing to find the person and the tool you need. Not only this, but the humour appears to have evaporated. The slapstick cutscenes and comedic grunts and mumbles have gone in favour of actual dialogue lifted from the film, and while it may help the story (if you can translate the mumbling), it is at the cost of the humour, however basic it has always been. As far as length goes, as with any LEGO game, it acquits itself brilliantly. The amount of mopping up to do is insane, with side-quests, puzzles, freeplay, and all manner of hidden goodies to discover will keep you going for an age, bestowing a longer life than Elrond to the game and delivering value for money like few other titles can claim. So, there is much to do, but not all of it is enjoyable. Indeed, thanks to some of the newish features, the enjoyment pretty much vanishes at points, and with the decision to play things straight, some of the charm has worn off too. Not every blockbuster or epic deserves the LEGO treatment and I think that The Hobbit falls into that category. Although the music and visuals are stunning, with some chapters being pretty fantastic in their telling – the Stone-giant battle and the smart switching between splintered sections of the company in the High Pass being standouts – the small flaws and annoyances start to stack up. The usual LEGO problems are all still here – iffy camera, uncontrollable vehicle/mount/run like buggery sections, but they take a back seat to the cast issues, the constant battles and QTEs, endless trekking to objective start points, and myriad of other issues I’ve already covered. Oh, and not once did Thorin sit down and start singing about gold. It is a reasonable LEGO game, with some standout moments… but it isn’t anywhere near being one of the best. Only having two thirds of the trilogy is a crime. Warner couldn’t have bloody waited until the third film was out? Who is everyone and have you seen the guy with the bow? Is that him? Is that him? Who am I? Who has the slingshot, anyone? Anyone? Bueller? Why the hell am I carrying a ladle? Combat, more combat, more QTEs, big combat scrums which can get messy when you still don’t know who and where you are in the melee and who has the damn bow. Seriously, where is the haircut with the bow? While it was an inevitable blockbuster choice for the LEGO treatment, perhaps shouldn’t have been, as it doesn’t quite fit, somehow. The lack of overall charm and myriad of annoyances and issues mount up until the frustration exceeds the usual levels expected in a LEGO title. The endless, often blocked, paths between sections of the story are irritating, although understandable in wider context if you consider it a nod to authenticity, but the missing third piece of the story is a pretty low blow. Worse is the samey character roster, leading to messy confusion in the scrum during frequent combat sections – a problem compounded by the inventory system, leading to frustrating faffing about. The haunting score, some standout levels, and impactful visuals lift the game up, but not quite high enough to clear the litter of annoyances and be considered among the greats of the LEGO series.